This is the first in a series of blog posts / videos about Google Calendar. When schools move over to Google, Calendar is both a service schools depend on teachers being competant at, as well as one in which teachers have varying degrees of competency. The first post will focus on Adding An Event. 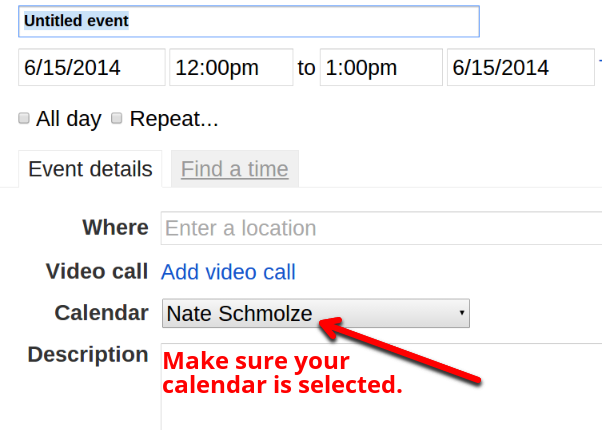 All you need to do is go into your personal calendar, Nate Schmolze in the example below. You must first find needed a date and time on the calendar and click in the desired area to begin adding an event. You will see a window such as the one on your left. You will begin by putting in an Event Title, and then select your appointment date and time. It will become more important later, but it is always good to double check that you are in the desired calendar. An important thing to remember, which is often forgotten, is to add a description. I have seen staff add an event to a meeting, but then not offer any details such as a room number. When you have finished your description, click save. Congratuations, you have added an event to your calendar. Below you will find a video where I take you through the steps outlined above.